My love for colour and fabrics have inspired me and I hope in turn to inspire you. What started out as a hobby has transformed into a whole new world. As a child I spent many hours sewing with my granny. She was such a big influence in my love of fabrics. This love has just grown over the years. From sewing Barbie clothes , to running a dress making and design business to finally home décor. Looking back I can seriously not remember a time that I did not paint or sketch. Whether it was just for fun or a work related project my art has always managed to get me through the best and worst times. Like a good friend or a great book my art is such a blessing. Please take a walk through the gallery. I hope you can lose yourself in the wealth of colour. She grew up on Natal South Coast. Studied art at school and achieved a 3 year diploma in Clothing Production Management at Natal Technikon. 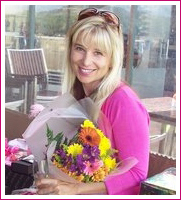 Kim currently lives in Cape Town with her husband and two children. Her love for her family and beautiful things has inspired her to paint and sew luxury items for the home. Her work has been sold both locally and internationally. She firmly believes that we are all blessed in life so as to be a blessing to others and she aspires to live by this belief. We accept Mastercard, Visa, instantEFT and Ukash payments.